A presidential limo known as "The Beast" carrying President Donald Trump and first lady Melania Trump arrives outside Blair House across the street from the White House in Washington, Dec. 4, 2018. 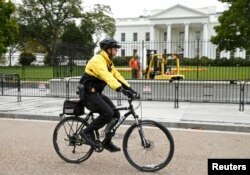 FILE - A member of the U.S. Secret Service patrols on bicycle in front of the North Lawn of the White House in Washington, Oct. 23, 2014. Secret Service agents stand on the running boards of President Franklin D. Roosevelt's car, carrying the president and the Earl of Athlone, Governor General of Canada on his visit to Washington, March 22, 1945. “In the past, we taught what’s called threshold-braking. Or if your car didn’t have anti-lock brakes, you would bring the wheels to the point they’re almost locked up but not quite,” Murach said.